To any hunter, simplicity and ease of use dictates the gear purchased for his/her day of hunting. Well, with Hunter Safety Systemâs new Muff-Pak, keeping hands warm and gear at the ready doesnât get any better than this! The HSS Muff-Pak contains pockets specifically designed to hold range finders, binoculars, can-style calls, rattle bags, grunt tubes and more, all within reach without unnecessary game-spooking movement. Topping this off is the warm, fleece, hand muff ergonomically angled for comfort while sitting or standing. This thing has been a lifesaver this season. I’ve tried every solution to keep my hands warm during my past 6 seasons as a hunter. Thick insulated gloves work for a bit, but you cant feel your bow release or your gun trigger. Thin gloves are fine but still get cold in your pockets after a few hours. Hand warmers work okay but when they’re used individually in your jacket pockets they cant retain as much heat. Stitching is excellent. Zippers are of high quality. The material is very comfortable on the inside. I’ve found the best way to utilize this system is to put 2-4 hand warmers in the pouch section where your hands go. I wear a thin pair of gloves or no gloves at all. This thing will stay roasting for hours. During the late season I was able to put hand warmers in at 530am and the muff-pak would keep my hands warm until dark. This is the first hunting season I have been able to keep my hands warm and comfy for all-day sits. It stands up to windy and frigid conditions no problem. The only thing I haven’t tried yet, is using it in rainy/wet conditions. I doubt it will stay dry though since most of the material is fleece-like. The strap is just a bit too long to use as a belt for me (36in waist) but was just right for over the shoulder/over the neck use. The storage pockets are big enough to fit a 20oz gatorade bottle. The pocket on the outside is perfect size for my rangefinder. The material is silent in the treestand so you don’t have to worry about noise when it rubs against your jacket or other gear. For 15 bucks this was the best investment to remain warm and comfortable for many hunting seasons to come. Bought this right before going to the Lapland area of Finland. We went there the end of January hoping to get pictures of northern lights. That means you are outside at night in zero or lower temperatures for hours. Not only did we spend probably 3 hours or more one evening watching incredible auroras, but this muff did all I hoped. I had a large hand warmer pack in here to keep my hands warm. I also kept several camera batteries in it to keep them warm. It worked so well I didn’t use my mittens much that night. Just kept my hands in here. Oh and it is super soft too. Way softer than I thought. As someone else said it isn’t water proof but I wasn’t planning to be out in the rain anyway. Very happy with my purchase. Excellent product. Well made. Bulky, in a good way.. WARM! I have hunted in 20 degree F temperatures with this and have still not needed to put in hand warmers, but I like the idea of having that option. I also like the extra 2 pockets in addition to the hand warmer holders. I keep my scope/binnocular cleaning cloth in the little one. 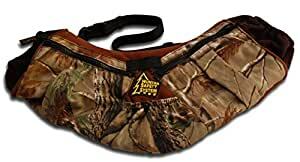 When I drag my deer out of the woods, I put my water bottle in the muff so it is more easily accessible as I am quickly getting thirstry during that part of the hunt. This is one of the best hunting purchases I have made. If you currently hunt with bulky gloves that get in your way, stop what you are doing and buy this. I use very thin gloves or no gloves at all with this muff and stay very warm. Great product. I started using this Muff Pak when I switch from shooting a wrist strap bow release to a hand-held release. I wanted to shoot the hand-held release without gloves, but needed to find a way to keep my hand warm. The Muff works great for that! It keeps my hands warm down to about 40 degrees with no problem. When it gets colder than that, I insert a Zippo Hand Warmer. The Muff has excellent zippered pockets on the top, and a small mesh pocket on the back. It also has a small pocket on the front that has elastic around the top. All of these pockets provide plenty of storage. The cuffs openings are about the right size for my hands (medium) and I have no problem sliding my hands in and out. The waist strap is highly adjustable, which I really like because it adjusts to the coat I am wearing. I bought this to use in place of a backpack, hoping to minimize my gear and save my back a little stress. The features seem great, with all the pockets, etc. I am a 5’3″ female with a 33-inch waist and even with the strap as tight as it would go, this thing would fall off of me, even when I tried scooting it down to my hips (about 36-inches). I even tied the strap 4 or 5 times to make it smaller, but i still never could get it to fit. The other problem I have with this product is the the area where you put your hands into to keep warm is HUGE and the wool inside is not very thick. A male friend of mine has something similar to this product and his is what made me want to get one. His hand area is very snug and thick and fluffy and does a great job of keeping his hands warm. There is no way my hands would ever be warm in this one because of how roomy it is, even with hand warmers inside. The product seems to be made well enough and the pockets will hold quite a bit of stuff and ammo – however I won’t know about long-term quality because I can’t use it and I am trying to find someone to give it to. Bottom line: Unless you have a pretty good size waist and large hands and wrists – save your money. I tried this out deer hunting on a frigid Wisconsin day. I was out from before sunrise to after sunset in a stand, and my hands were kept warm without gloves. The wind was not an issue and provided no discomfort. This is a bit of a godsend because I’ve yet to find a set of hunting gloves that really work. Either my hands freeze or the gloves are too thick to shoot with. In this case, I didn’t have to worry about thick gloves, my hands were warm and toasty until it was time for me to pull them out. I was able to take my shot and bagged my deer. I’d like to think part of it was because of these hand warmers! I love this thing first time I’ve ever used one. I put one 18 hour hand warmer in there. This would last for a morning hunt and after noon hunt and then some. There’s two zip pockets on the outside and one open Pocket on the outside. The handholes are snug and allow a little air when hands are inside. I wore this one around my neck and when drawing my bow I just rotate to my back and works great.